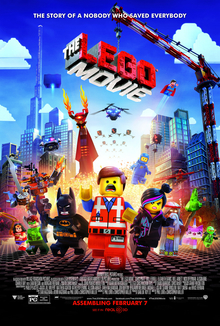 The Lego Movie is one of the best animated films in a while, a terrific original idea, executed flawlessly, with enough to keep the adults entertained, whilst fundamentally being a movie for children. The film introduces us to our hero, Emmet (voiced by Chris Pratt), an ordinary Lego man, who is mistaken for a master builder after stumbling upon a secret. This throws him into a battle to prevent the world from being destroyed by an evil CEO appropriately named Lord Business (Will Ferrell), ably assisted by a great voice cast (Morgan Freeman, Elizabeth Banks, Charlie Day, Nick Offerman, Will Arnett) who help his quest. The film is full of terrific references, with many classic characters represented, from Batman to Abraham Lincoln, to the cast of Star Wars. Most of all, the film is just great fun. The Lego world is wonderfully realised through the animation, and the voice cast are clearly relishing the fun they are having. And to top it all off, the film does something really unexpected and the results are extremely heartwarming. Clever, very funny, and terrifically realised, this is an excellent piece of animation.